Set hotkey for the day difference calendar as a fast shortcut! From 1.51 is easy to set a hotkey to start the desktop calendar with a shortcut! (Image-1) Set hotkey for the day difference calendar as a fast shortcut! As you can see above in Windows 10 shot screenshot, you can quite easily set the hotkey to the desktop calendar without having to aim at the taskbar icon, now even faster via a keyboard shortcut! You can apply this solution easily and without hesitation also on earlier and older versions of Microsoft's Windows operating systems to start the Desktop-Calendar via keyboards short-key. It also does not matter to the calendar if it is defined as a shortcut key on the native Windows desktop computer or on the mobile tablet PC, Surface Pro / Go as a hotkey. It is really very useful and beneficial these shortcuts, especially for users who use the desktop Calendar in the office to calculate day and date difference more and more and often. It is a simple yet effective tool that has been tested and successfully verified on various MS-OS . 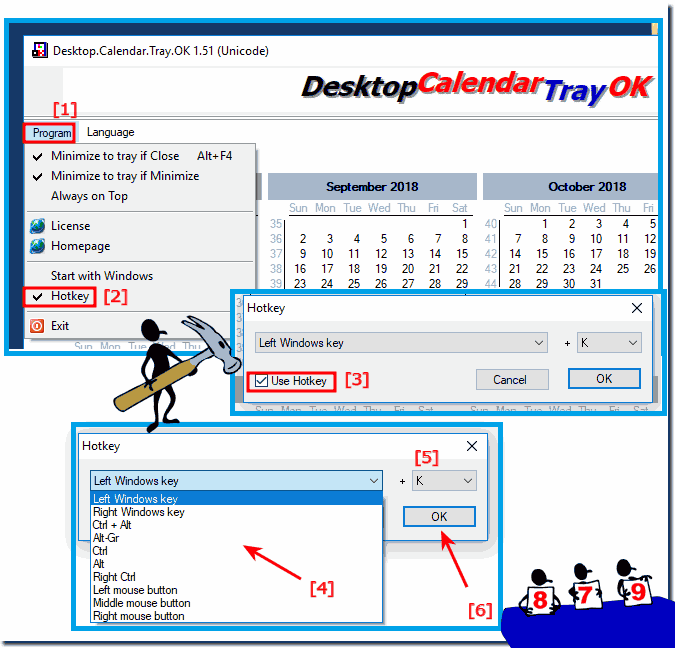 Desktop.Calendar.Tray.OK - FAQ-6: Set hotkey for the day difference calendar as a fast shortcut!